Two customers on Friday celebrated Christmas early as they were gifted $2 million each as part of the annual Courts ‘Big Prize’ promotion. Wendy Vieira and Mr Deonandan were the two lucky individuals out of seven who were eligible to win $2 million each from the company’s major giveaway. The Courts ‘Big Prize’ promotion was launched on November 1, at the Courts Main Street store and saw the furniture and appliances giant investing over $16 million. 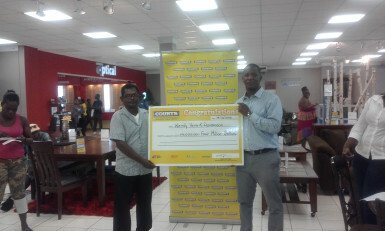 Mr Deonandan (left), one of the $2 million prize winners and Marketing Manager Pernell Cummings pose with the award cheque. Along with the two grand prize winners were those who took part in the Frigidaire promotion and the Paint promotion during the month of November. There was a total of eight winners in the Frigidaire promotion among whom were Shemlyn Jordan, Alanna Livan, Nandani Persaud and Lorraine Husbands, each winning an $180,000 shopping spree at Bounty Supermarket. These persons were not only from the Main Street store but the other branches as well. The Paint promotion saw a total of three customers each win a $90,000 paint gift certificate from Harris Paints. Those three persons are Aywen Austin, Robeno Rogers and Delroy Williams. Courts Public Relations and Promotions Officer Roberta Ferguson stated that this is the second year since the paint promotion was introduced and they have been receiving positive feedback from their customers and will be sure to bring it back. One other lucky Courts customer is set to receive the final $2 million cash prize at the next drawing, which is scheduled for some time this week.